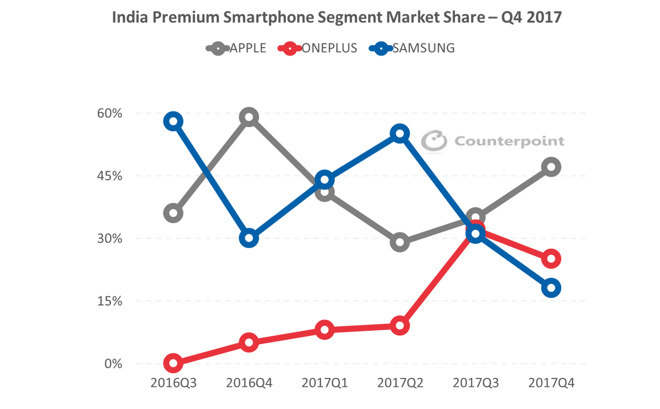 Despite intense competition from China's OnePlus, South Korea's Samsung and others, Apple has retained the lead in India's premium smartphone market, crushing Samsung (which exceeded Apple's share last year) and severely blunting the formerly rapid expansion of OnePlus. According to new market data from Tarun Pathak of Counterpoint Research, Apple accounted for 47 percent of all smartphones priced above INR 30,000 (around $470 US or 380 Euros). The release of Apple's new generation of iPhones helped drive OnePlus from 25 percent share in the September quarter down to 19 percent share in calendar Q4, while Samsung was again pushed into third place, a significant drop from its position near 30 percent one year ago, and its share above 50 percent last summer. Despite competing against other "premium" handsets that sell for far less than half of its entry-level price (iPhone X has a starting price India of around $1,326 US), iPhone X accounted for 21 percent of all sales in the "$470 and up" premium category. iPhone X outperformed sales of the second place OnePlus 5T by more than 23 percent, despite that phone being priced starting at about $520 in India. OnePlus is the premium-tier brand of BBK Electronics, which also sells Oppo and Vivo, two brands that are frequently described as being two separate Chinese companies. Apple's iPhone X also bested Samsung's nearly as expensive third place Note 8 by more than 162 percent greater sales, prompting Samsung to slash its price in India in December. Counterpoint noted that iPhone 7 also sold well in India, although it stated that "iPhone 8 remains soft and, as a result, the overall Apple shipments in the premium segment declined 31 percent YoY. The decline is also partly due to last year's strong quarter when sales of the iPhones spiked owing to demonetization and the high volume of cash transactions." The report also noted that "the Indian premium smartphone segment grew 20 percent annually by volume and 28 percent by value in CY 2017." In addition to dominating the high end, Apple is also working to expand the production of its less expensive iPhone SE and 6s models in India with local manufacturing by Wistron.